VxBlock 1000 sounds like a very powerful and flexible approach to converged infrastructure. Is there some way that I can compare the business value and benefits versus building our infrastructure from individual components? Hey experts! What is different about the VxBlock 1000 compared to prior Vblocks and VxBlocks? The VxBlock System 1000 can have VMAX 250F/FX, VMAX 950F/FX, or Unity 350F/450F/550F/650F as primary or secondary storage today. In addition, Isilon Gen6 is available for guest access. The VxBlock System 1000 is also the first VxBlock to allow multiple storage arrays from the factory, without the need for a Converged Technology Extension. As Mark posted above please look at the product overview guide..
Colby, here is a summary of what's new with the VxBlock 1000. 1) We wanted to simplify the Block product line which had become very complex with 3 different products in VxBlock 350, 540 and 740 PLUS expansion via a range of Compute Technology Extensions (B- and C- series) and Storage Technology Extensions (VMAX, XtremIO, Unity, Isilon) and management (AMP-2S and HA-AMP). This made for a highly scalable but complex array of options to create a flexible converged infrastructure solution. The VxBlock 1000 now offers a SINGLE product that enables a company to order and scale their CI from just a few compute nodes in a single domain and a single array at the start ... to a massive multi-domain system with hundreds of mixed node types and numerous array types in a single product descriptor with a single RCM. 2) We can grow our new AMP-VX from managing a single VxBlock 1000 to managing multiple VxBlock 1000s and later this year it will manage a heterogeneous mixture of Dell EMC converged systems! The compute environment can be comprised of 100% UCS blades, 100% UCS rack mount, or a mixture. 100% rack mount is new! Isilon is can be a fully integrated storage option which connects directly into the system fabric saving added switches and costs. AMP-VX now has embedded data protection so that your management infrastructure is inherently protected. 4) Finally the new RCM Portal is our first step in simplifying the way RCMs are reviewed and consumed by our customers for their converged systems in production. The portal provides a variety of ways to look at RCMs by system (VxBlock 1000, etc. ), compare eligible RCMs, setup automated notifications when an RCM train changes, etc. The big improvement here is an RCM view by the whole solution deployed (VxBlock System 1000 plus AMP-VX plus Data Protection), rather than getting multiple individual PDFs in the past (for example one for VxBlock System 740 plus one for X2 STE plus one for UCS-C CTE plus one for AMP2S). 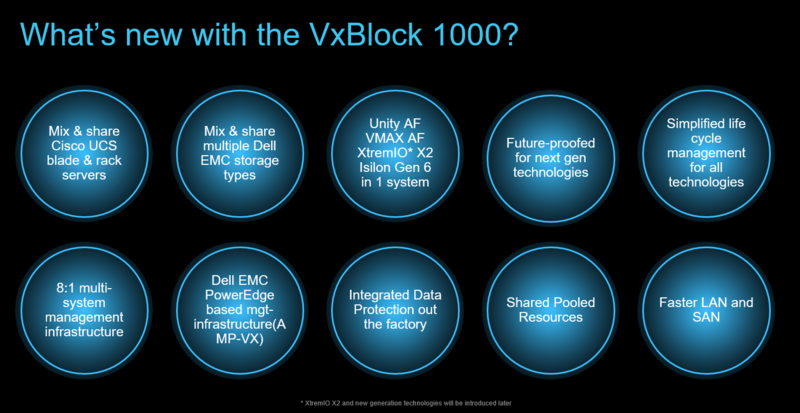 Hopefully this provides more insight into the new enhancements in the VxBlock System 1000. Thanks to all the participants and experts! We've learned the new VxBlock's evolution . I am locking this ATE thread since this event has ended (with 2,777 page views).